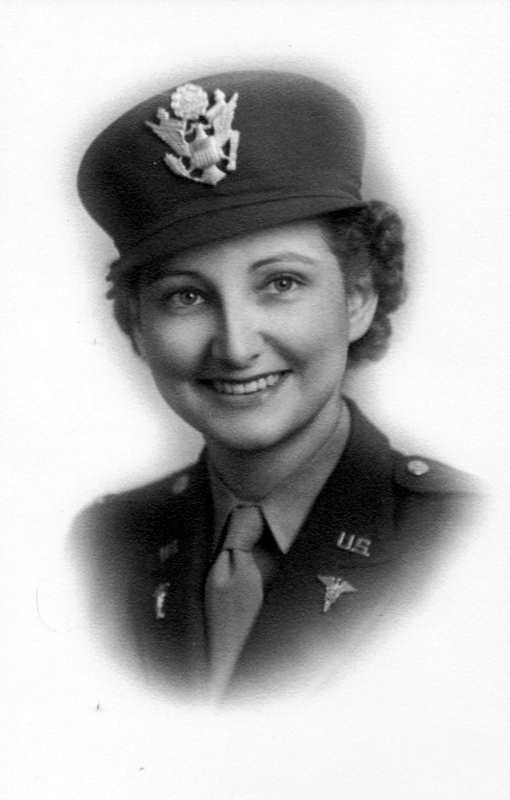 1st Lt. Marcella Zaborac of Englewood, Fla. is pictured as an Army nurse in her mid 20s during World War II. She served with the 110 Evacuation Hospital in Europe. 1st Lt. Marcella Zaborac of Englewood, Fla. came ashore on Normandy beach in August 1944 with Gen. George Patton. She served as a nurse with the 110th Evacuation Hospital in “Ol’ Blood-N-Guts” 3rd Army that fought its way across France and into Germany during World War II. Growing up in the Texas Panhandle, Zaborac graduated from nursing school at Lubbock General Hospital in Lubbock, Texas. 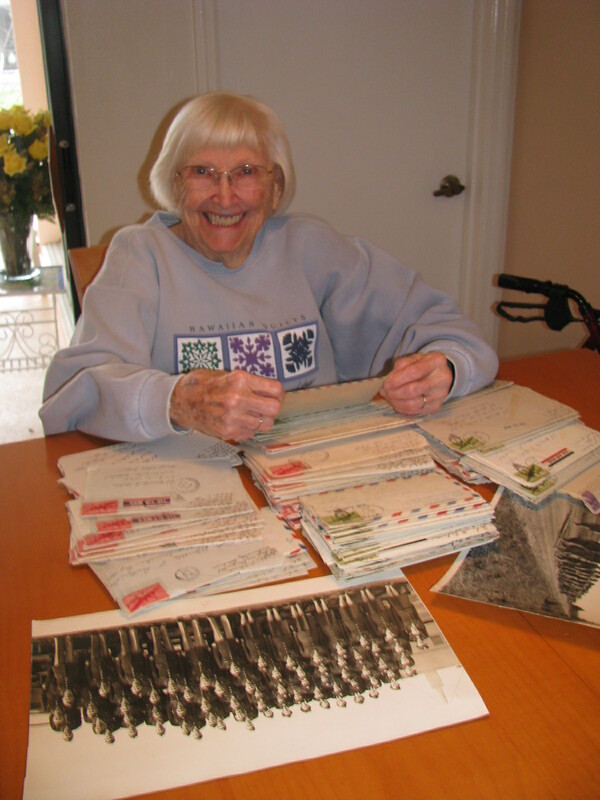 She received her RN degree in 1941, just in time for the Second World War. The biggest challenge facing the members of the 110th Evacuation Hospital was keeping up with Gen. Patton and his troops. “He was moving fast across France,” she said. A small sheet of blue-green writing paper was neatly penned with the dates and places they went during the first six months the 3rd Army was in Europe: Arrived Normandy, France Aug. 25, 1944; Courtealin, France Aug. 25-Sept. 5; Chalous, France Sept 5-10; Rambicanet, France Sept. 10-30; Esch al Vet, Luxembourg Sept 31-Feb. 12. “When we started across France with Gen. Patton the rainy season had started. By the time we reached Luxembourg it was raining almost every day. There was mud, mud, mud everywhere,” Zaborac said. 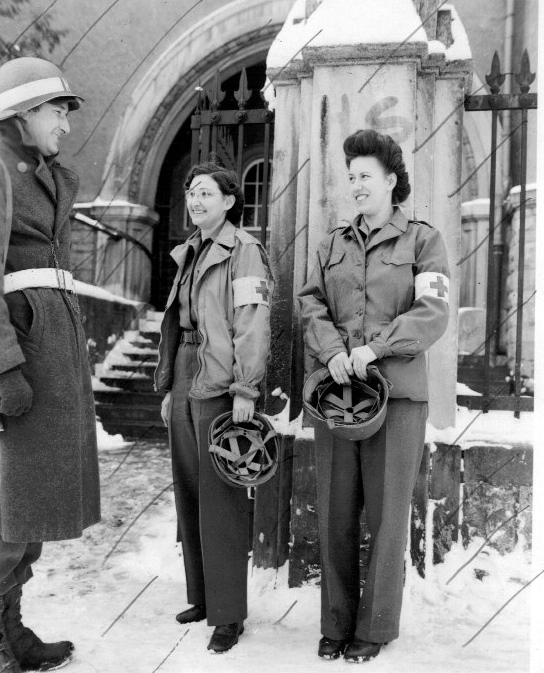 Lt. Marcella Zaborac (center) and fellow nurse Lt. Helen Anderson of Duluth, Minn talk to Pfc. Maurice Neiming of Birmingham, Ala., a guard outside the front gate of the 110th Evacuation Hospital in Esch al Vet, Luxembourg during the winter of 1944. Our army took over an abandoned three story school building in Esch al Vet which was a big improvement over the tents we had been caring for our soldiers in,” she said. “It was much warmer and drier in the stone building than in the tents. “The weather grew increasingly terrible. In addition to the rain and mud it started sleeting and then came the snow. By December we had a couple of feet of snow on the ground and the temperature was the coldest recorded for Western Europe in 50 years,” the 90-year-old retired nurse recalled. Zaborac said the nurses found living quarters in what had been Gestapo headquarters in Esch al Vet. “When the Battle of the Bulge began in mid December at Bastogne, Belgium, about 50 miles away, we were the only American hospital in the area,” she said. “We got all the patients from the Bulge. “These young soldiers were coming into our hospital in terrible shape. We did what we could for them and if they were transferrable we sent them on to a general hospital further behind the lines. If they weren’t, we kept ‘em and nursed them until they were,” Zaborac added. How did Zaborac and the rest of the doctors and nurses handle the stress of treating one young soldier after another who was missing an arm, leg or was dying from a stomach wound or badly burned? “Thank God we were young. I think that was the thing that saved us because we didn’t realize how bad it was,” she said. “Furthermore we didn’t have time to think about it. We had to take care of our patients. You knew you had come to do this and you did your work. “As fast as we patched up a patient we tried to move him out in 24 hours or less. There would be another young soldier waiting to take his place in the surgery room or on one of our cots in the hospital. “Thank God I was 24. I would have never made it,” Zaborac observed. Following the Battle of the Bulge, she developed a serious cough. Doctors at her evacuation hospital decided that conditions were too primitive for her where they were headed. They were about ready to hit the road again and go back into tents. She was reassigned to the 202nd General Hospital in Paris. “I was station there as a floor nurse until I went home,” she said. “I came home by way of New York City on a troop transport with thousands of other military people returning from the war. They put me on a train and shipped me back to Iowa where I was discharged in Nov. ’46—almost three years to the day from when I enlisted. How does Zaborac feel about her service in World War II? “I was happy I could serve my country and help my fellow man, my boys. I don’t think I was overly patriotic, but I am glad I did what I did,” she said with conviction. Commendations: European African Middle Eastern Campaign Medal with three bronze battle stars, World War II Victory Medal, American Campaign Medal and two Overseas Service Bars. This story first appeared in the Charlotte Sun newspaper, Port Charlotte, Fla. on Monday, March 1, 2010 and is republished with permission. Marcella Lee Zaborac, 97, died Monday, July 17, 2017. She was born on February 6, 1920 in Shattuck, Oklahoma, to Oscar and Nina Baysinger Rector. She graduated in 1936 from Follett High School in Follett, Texas. After graduating from Lubbock Sanitarium School of Nursing in 1940, Marcella worked as a RN at the Shattuck Hospital. She enlisted as a 2nd Lieutenant in the Army Nurse Corps on November 24, 1942 and was assigned to the 110th Evacuation Hospital. After field training in California and Washington, her unit was shipped to England to prepare for the invasion of Europe. Assigned to General George Pattons 3rd Army, she came ashore in Normandy on August 25, 1944. During her 15 months overseas, Marcie, as she was known to her friends, served in Army hospitals in France and Luxembourg. Returning to the United States, she was discharged from active duty on January 13, 1946. On January 22, 1944, Marcella married John F. Zaborac in Oklahoma City, Oklahoma. To this marriage were born three children; John, Jr., Charles Jerome (Jerry) and Melissa. The family lived in Cuba, Illinois and later on the farm in Farmington, Illinois. After retirement, she and John lived in Canton, Illinois and Englewood, Florida. Marcella was a registered nurse for more than 40 years. She is survived by her son, John, Jr., her daughter, Melissa, granddaughters Amy and Marni and great-grandchildren, Cash and Cora. She is preceded in death by her husband, John, in 2005 and her son, Jerry, in 1968. Graveside services will be held in Canton, Illinois at a later date. Wonderful story; thanks for sharing it with us all! We thank you so much for your contribution to our freedom. Thanks for the kind words about the Army nurse story. She’s something else at 90 years old and still going strong. Hope you’ll continue to check out the stories on my war tales web site. I put up 3 new ones a week. My father Albert G. “Al” Falk was a first lieutenant assigned to the 202nd General Hospital during WWII. He was a Medical Administrative officer in charge of the kitchen/food services. He spoke of receiving a Good Conduct Medal and an interesting set of circumstances surrounding the award. It is possible that his and Marcella’s paths crossed. Robert W. Berg, MD, my father, served with the Third Army through the Battle of the Bulge to the war’s end. He too may have worked with Mrs Zaborac at Esch al Vet. Thank you for your story. My dad died in 1971, and my siblings and I know very little of his wartime experience. Mrs Zaborac’s story and her service are much appreciated. My father John A Wood Jr may have known her. He was with the 623 Medical Clearing Co. They set up a station in a field near the 110th Evac. Hospital in Oct. of 1944. They acted as a holding station caring for the patients the Evac. Hospital couldn’t handle. The 623rd then moved to a former school building and German Maternity Hospital at Schifflangen, Luxembourg. The 110th Evac. Hospital moved into a building at Esch. Luxembourg about 3 miles from where the 623rd was billeted. The 623rd worked with the 110th at their hospital during the winter and during the Battle of the Bulge. unfortunately my Father is now deceased. Does anyone remember my Aunt & Godmother, 1st Lt.Julia Theresa McDonald, RN, from Waterbury, CT? She and her best friend Mary O’Leary, RN, were on the first Troop Train into Germany after the surrender. Noone knew if the Germans had learned of the surrender or if the train would be blown up. Julia & Mary must have been with the Third Army because Gen. Patton met with the nurses to thank them for their work. My Father, Jules Craiter, was with the 110th. From Texas to Passau. I just found this while researching the 110th. My mother Kedrann Wood served with her in the 110th Evac. first troop train into Germany after the surrender. She told me her group did not know if all the Germans fighers had heard of the surrender so it was a tense time wondering if the train would be bombed. Any leads you can supply will be gratefully received. Rosemary, I don’t see Lt. Julia Theresa McDonald listed as a member of the 110th Evac. According to the book of the 110th, they were in Esch (Esch-sur-Alzette), Luxembourg during the Battle of the Ardennes. There were two other Evac hospitals mentioned in Luxembourg at that time, the 107th and 102nd. They did eventually move by convoy to a German hospital in Bad Kreuznach Germany were they were joined by the 39th and 121st Evac. I hope this helps.